Metro Standard Duty MW Utility Carts offer a level of versatility and durability you’ll find nowhere else. These cart systems are available in the sizes and styles that will best suit your environment. Therefore letting you create a highly-effective transport system no matter what the need. 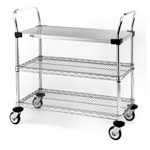 Metro standard duty carts are ergonomically-designed for low-effort transport. Additionally they give you the precise handling you need to maneuver in close quarters. Metro MW Utility Carts offer the most efficient way to create mobile space. Because they offer a level of versatility and durability you’ll find nowhere else. These cart systems are available in the sizes and styles that will best suit your environment, letting you create a highly-effective transport system no matter what the need. So Metro carts are ergonomically-designed for low-effort transport, and give you the precise handling you need to maneuver in close quarters. Wire Shelves: Bright, modern, sanitary appearance. Open construction minimizes dust accumulation, maximizes visibility and air circulation. Finishes available in chrome or type 304 stainless steel. Solid Shelves: Made from type 304 stainless steel w/ epoxy coated corners. Ideal for transporting materials that require an expanse of flat surface. Raised ship’s edge permits fast clean-up in case of liquid spills. Double thickness of 18-gauge steel at edges also gives rigidity and high strength. Super Erecta Shelf Construction: Makes units easy to assemble with absolute rigidity, and makes relocation of shelves quick and simple. Strong and Durable: 375lbs. (170kg) weight capacity per cart.